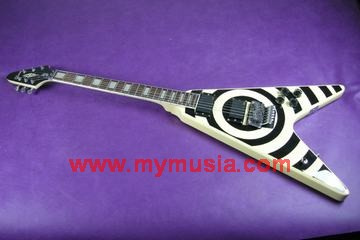 Another Zakk Wylde Counterfeit Custom – This time it’s The V.
Ok, I give credit where credit’s due and I found this V on a site selling very dodgy Gibson copies by reading a post by Double Basser in the Ultimate Guitar forums. In his post he tells of this website and goes on to post his entire msn conversation with the “scammers”. Definitely worth a read. Now I’m a fan of the Gibson Flying V, I don’t know why but I am, I’ve had a couple of Les Pauls and an SG but for me the V just has a certain something. I always thought it would be hard to tell a fake Flying V from the Ted McCarthy designed original and it’s various revamped successors, especially the ’67 as the only main difference to look at can be a name on a truss rod cover. Well thankfully whoever banged this one together decided to make it easy. 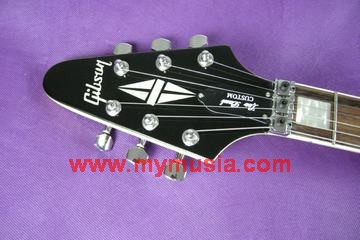 As usual the Gibson logo looks about as convincing as Robert Mugabe’s recent re-election and as before on the Phoney Flying V the truss rod cover says “Les Paul Custom”, do they think we can’t read? 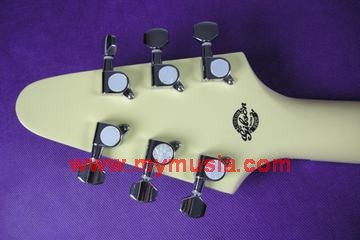 Note the lack of a serial number on the back of the headstock, they didn’t even bother with the usual fake stamp or “Made In USA” found on so many of the Chinese imports. Zakks silhouette is also noticeably absent, the dodgy Les Paul Customs at least have an attempt at one on the back of their peg heads. The other giveaway is once again the price, $249; So that’s cost price on the pickups and the rest is free right?